(left to right, top to bottom) Jay Ruyeras Orehuela, Gilbert Paul Peligrino, Grace Christine Salazar, Care Garsuta, Michael Uy, Faye Antonette Mejares, Janine Fuderanan, Joan Paola Arabejo, Jerryl Ceballos and James Dominguez. 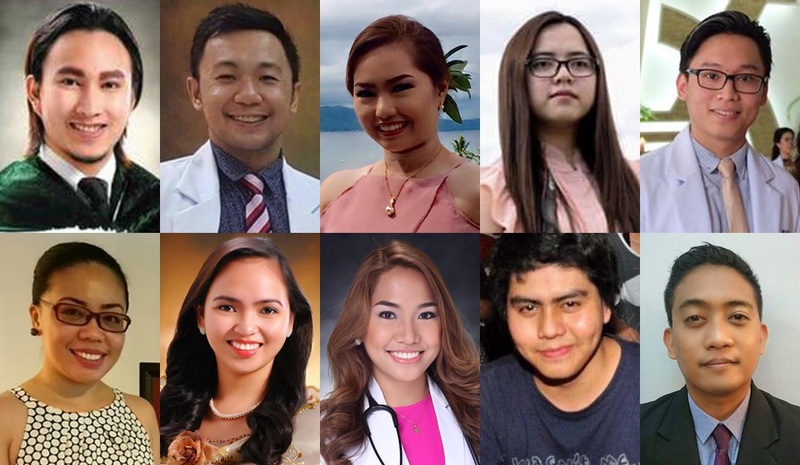 Thirteen Boholanos passed the March 2018 Physician Licensure Examination administered earlier last month, according to a list obtained by the Chronicle. Jay Ruyeras Orehuela, an alumnus of Southwestern University and a native of Pangangan, Calape, led the Boholano board passers as he ranked second overall in the examination which was participated by 1,601 examinees. He passed the exam with a rate of 88.00 percent. According to the Professional Regulatory Commission, 1,067 out of 1,601 examinees passed the licensure exam. The list of passers included Boholanos Care Garsuta, GIlbert Paul Peligrino, Grace Christine Salazar, Michael Uy, Faye Antonette Mejares , Janine Fuderanan, Jerryl Ceballos, James Dominguez, Earl Constantine Escalona, Fredyn Will Orohuela, John Jane Batirzal and Joan Paola Arabejo. Meanwhile, Jerald Lalaguna Pelayo of the University of the East Ramon Magsaysay Memorial Medical Center topped the exams with a rating of 88.17 percent.